One of my favorite things about living in New York City is checking out the fall colors on my bike commute through Central Park. However, for subway commuters and tourists who don’t get to cruise through the park every day, this can be a tough thing to catch, because the leaves in the heart of the city don’t change color until roughly two weeks later in the season than nearby suburban and rural areas to the north and west. A visitor consulting the Weather Channel’s maps, or other common resources, might be misled by the lack of detail focusing in on New York City. Peak color in Central Park occurs between the last weeks of October and the last weeks of November, depending mainly on whether or not there are cold nighttime conditions. 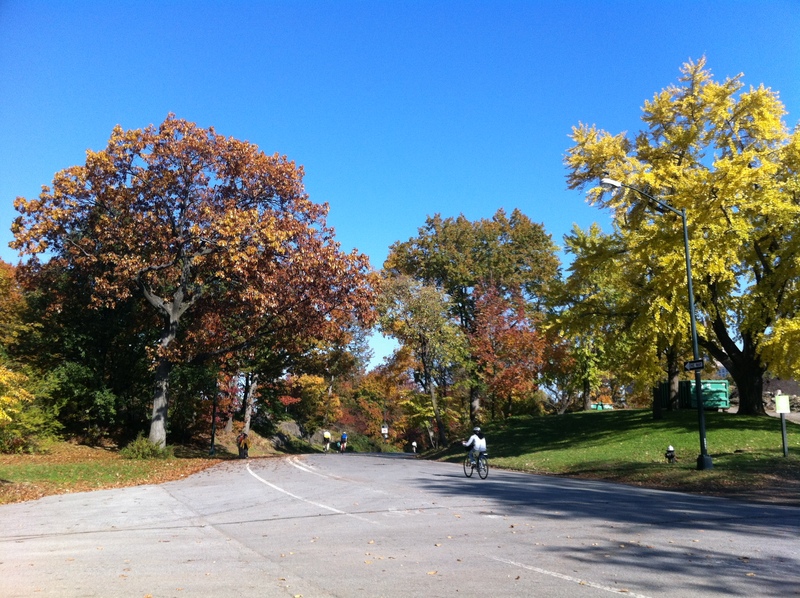 An excellent resource is “How to enjoy autumn leaves in NYCs Central Park“. That site includes phone numbers for checking on the current leaf colors. The Central Park Conservancy webpage can also be a great resource. So, why do the leaves change color later in NYC? This is a question I’ve been looking into for fun, but also because it relates to our research on the Urban Heat Island and the city’s microclimates and the impact of the nearby ocean on city temperatures. The atmospheric heat island keeps temperatures warmer overnight and is caused by the prevalence of paved surfaces instead of plants, as well as the reduction in wind speed and air movement caused by buildings. Air temperature measurements at 1:15 AM during a recent heat wave. The 240 weather stations demonstrate how some neighborhoods around New York City were as much as 15 degrees warmer than rural areas. Data credits given below. Also see a similar map for January. This shows a map of temperature for one of our summer heat waves, not for fall season — I’ll be looking at the new data that comes in this fall, to see if the same large temperature difference exists on cold fall nights, but I suspect it will. Of course, the heat island effect inside Central Park may be weaker than surrounding parts of the city, as it is full of greenery. However, the evidence I have seen, including temperature data from Central Park (Belvedere Castle), suggest that the city’s heat overwhelms this localized effect — during our summer’s heat waves, Central Park’s nighttime low temperatures were only a degree or two cooler than the other interior urban sites. So, this likely explains the long delay in color change we have here. 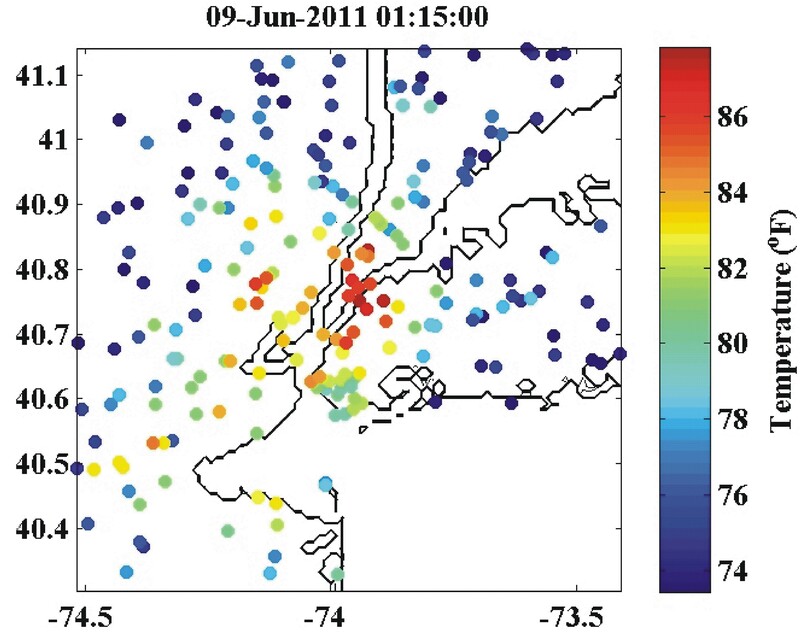 However, the ocean may also help explain the delay, particularly if you are looking for leaf changes along the Hudson River, Long Island Sound, or out on Long Island — the ocean can moderate nighttime temperatures, too. But my hunch is that the difference for Central Park is due to the heat island. 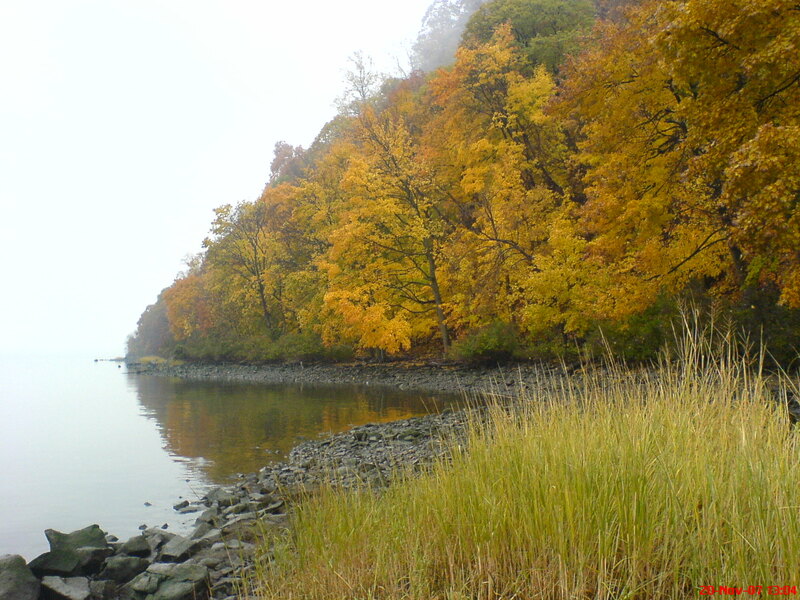 Photo taken along the western bank of the Hudson River, below Lamont-Doherty Earth Observatory at the NY/NJ State Line, on November 20th, 2007. This entry was posted in water, weather and tagged Central Park, cold, color, fall, foliage, frost, heat island, Hudson River, Manhattan, New York City, night, November, October, peak, Prospect Park, season, trees, urban. Bookmark the permalink.